Where does the seminarian go to college or graduate school? A diocesan Priest can best be described as a PARISH PRIEST. Diocesan Priests also serve in a variety of other capacities such as campus ministers, teachers or chaplains for hospitals, or prisons, but basically they are the Priests who minister to the day-to-day needs of people in parishes. He is called a Diocesan Priest because he commits himself to the service of God's people within a definite geographical area called a diocese. Everyone looks for meaning and fulfillment in life. For a Christian, life's meaning must have a relation to serving God. Many people serve God and find meaning and joy in the vocation of marriage. Others follow Him in religious life but some men feel called to a different kind of service to the Lord's Priesthood in a special way of serving the Catholic Community as its leader in prayer and worship and service. A diocesan (or parish) Priest spends much of his time in preparation for and in the celebration of the sacraments (Eucharist, Penance, Baptism, Marriage, Sacrament of the Sick, etc). Each day some time is set aside for personal, private prayer. Visiting the sick, visiting people in their homes and working with the various parish and neighborhood organizations are all part of his ministry. The parish Priest must also be available to people when they have special needs. He is frequently involved in individual counseling, (marriage problems, parent teenager problems, drug problems or just life in general). Like anyone else, a Priest must also find some time for rest and relaxation when he can do things he enjoys. A single man with average intelligence, emotional stability and sincere interest may qualify for the Priesthood. He must have a dedicated loyalty to the Church, a willingness to serve, and a zeal for souls. He should also be a person who is generous and looking for the challenge that comes with following the Lord Jesus Christ and His Church. For a man considering the possibility of Priesthood he must have four years of high school, four years of college, and four years of graduate study (Theology) and then be called by the Bishop to Ordination. You might feel that this is a long period of time but when preparing for any other profession (doctor, lawyer) it also takes a long time. 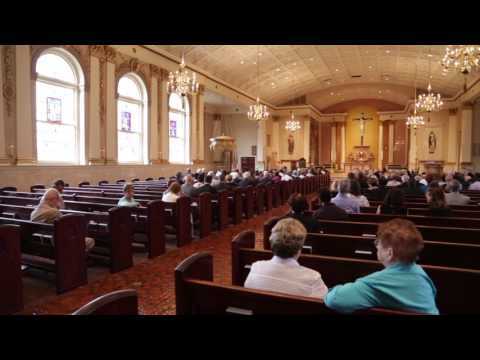 Our purpose is to fully prepare a man to minister to the people of the Diocese of Allentown. College students who are seriously considering the Priesthood in the Diocese of Allentown are sent to study at St. Charles Borromeo Seminary in Philadelphia. Students with a college degree and sufficient credits in philosophy and undergraduate theology will be admitted to the Pre-Theologate Division at St. Charles. Ordination is the sacramental ceremony in which a man becomes a deacon, Priest, or bishop and enabled to minister in Christ's name and that of the Church. There are three degrees of the Sacrament of Holy Orders: Diaconate; Priesthood; and the Episcopacy. The ordination ceremony includes various rites, rich in meaning and history, e.g., the prostration, laying on of hands, anointing of hands, giving of the chalice and paten, sign of peace. These are vestments which pertain to his office and have symbolic meaning. The stole symbolizes the authority and responsibility to serve in imitation of Christ. It reflects the line from Scripture: "For my yoke is easy and my burden light" (Mt II :30). The chasuble is the principal garment of the Priest celebrating the Eucharist and is the outermost vestment. A man has to engage in a challenging program of priestly formation which lasts six or eight years, depending upon his background. Seminaries address four types of formation: human; spiritual; intellectual; and pastoral. In addition to the academic course work, seminarians participate in a full schedule of spiritual activities, e.g., daily Mass, Liturgy of the Hours (Morning Prayer, Evening Prayer), spiritual direction and retreats. At each level of seminary training, the seminarian prepares for future pastoral ministry in various settings, such as schools, religious education programs, hospitals and parishes. All of the formation takes into consideration the human person; human growth and development is fostered by community living, workshops and other programs. The formation of future Priests includes practical learning, too, for example, preaching, saying Mass, and pastoral counseling.